duchenne muscular dystrophy | "Justin Lyng Day"
FYFCL brings awareness to duchenne muscular dystrophy. Declares 9/27/14 as “Justin Alexander Lyng Day”. To honor Justin, and to come together as a league to spread awareness, On September 27, FYFCL will partner with Coach to Cure MD to conduct a league wide awareness day for Duchenne’s. Please visit http://coachtocuremd.org/ to learn more. FYFCL’s campaign will be to raise awareness and raise funds for Coach to Cure MD. We will join hundreds of high schools and colleges participating on this day. See the list under the “Get Involved” link on the site: http://coachtocuremd.org/. FYFCL will be the first youth football and cheer league in the nation to join the hundreds of High Schools and Colleges participating in the day. About Justin Alexander Lyng … Justin was born on November 2, 2000 to Heather and Michael Lyng. The very moment his mother laid eyes on him she knew he was destined to something Great. Within his 1st year of life, Justin struggled to make his milestones. After several months and lots of doctors’ visits, Justin was diagnose with Williams Syndrome. However, that never stopped the stubborn, grey- eyed baby from achieving his goals to walk, talk, and to become independent as all little boys should. Justin managed to master more skills in less time than doctors thought he would and was doing wonderful. In 2011, when Justin was 10 years old and was healthy and doing amazing, he began to struggle with day to day things in life. Thirteen doctors and a few months later a muscle biopsy was conducted and on June 20, 2011 Justin was diagnosed with Duchene’s Muscular Dystrophy, a degenerative disorder that affects approximately 1 in 3,500 boys. It was at that moment that his family decided they needed to live every moment to the fullest. Justin was to live life on his terms and have no regrets. By the time Justin’s 11th birthday came, Justin looked his mother in the eyes and said “mommy, I can’t walk anymore, its too hard.” From that point, Justin was wheelchair bound. In a way, the wheelchair was a blessing because Justin got back some of his fighting spirit and kept on moving. Justin kept going with a smile on his face and a “conquer the world” attitude. Nothing could stop him from doing everything he could to live. In 2012, Justin and his family met a wonderful group of people: The Seminole Sharks. They gave Justin the honor of being their 12th man for their homecoming game. Justin absolutely had the time of his life the day he hung out with the Sharks, meeting so many people and kids that did not judge him for being who he was. In the spring of 2013 Justin family became part of the Shark family when his younger sister, Kyla, became a cheerleader. Justin loved being out there at every practice getting to know the players and cheerleaders and coaching staff. He loved watching his sister cheer at every game. During picture day the team presented Justin with his 1st Sharks jersey so he could wear what “his boys” wore. It was the #12 of course. He was not part of the team and he found another home and family. In the fall of 2013 at the Sharks first home game of the season, the Sharks did something that changed Justin’s world. As much as he loved being on the sidelines, sending the boys out, and cheering them on, his day got even better when the Sharks retired #12 in honor of Justin. Justin then received a new #12 jersey, a helmet and he took the field for the first time. And he ran the first play of the game with “his boys”! One of the happiest moments of Justin’s life. A few days later, Justin became really sick and was put in the hospital with a bad respiratory infection. He was released 4 days later just in time to make it to the Sharks big Cheer competition. Unfortunately, Justin never fully bounced back from this particular illness. After his 13th birthday he became so ill and so fast that he needed hospice care. Winter came and he still went out to a few games including the Angel Bowl that that “his boys” played in December at the Citrus Bowl and where Justin was given VIP honors. It was a bittersweet Christmas for Justin and his family. It was the best Christmas to date with Justin, but it was also when the doctors told Justin’s family that he would be leaving them soon. Justin was struggling with the disorders that were destroying his body, yet he was still smiling every time he went to spring practices and the spring game. Justin came to terms with what was happening and did so with poise, grace and mind blowing strength. Justin was done fighting and wanted to seek closure for those he loved the most. He wanted to make sure that everyone else around him was okay, putting everyone else around him at as much ease as possible, never thinking about himself. Justin passed on July 28, 2014. Justin touched so many lives and put a smile on everyone he met. Everybody in Justin’s world was his family, even if he just met you. To know Justin is to know Amazing strength, beauty, courage, love, and innocence. The most fitting quote for Justin is the following: “The brightest star always fades the fastest.” Justin is the brightest star to so many. It was heart wrenching to see him fade, but even through it all, he was still smiling and still living his life on his terms with no regrets. 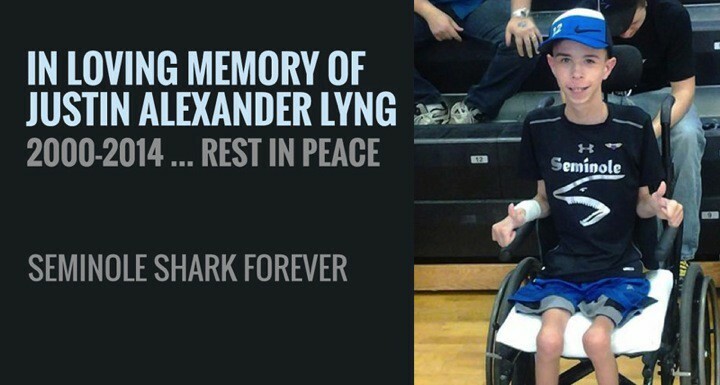 Justin Alexander Lyng, Rest in Peace. Florida Youth Football & Cheer League—"We Are Youth Football". FYFCL's Terry Riddle is winner of the 2014 Inspiring Greatness Coaches’ award.